PROFINET (Process Field Network) is the open Industrial Ethernet standard of Profibus & Profinet International (PI) for automation. PROFINET uses TCP/IP and IT standards, is real-time Ethernet-enabled, and permits the integration of fieldbus systems. The concept of PROFINET is modular, so that the user himself can select the functionality. This differs essentially in the type of data exchange to meet the speed requirements. PROFINET has been developed for real-time (RT) and clock-synchronized communication IRT (IRT = Isochronous Real-Time) with the decentralized periphery. 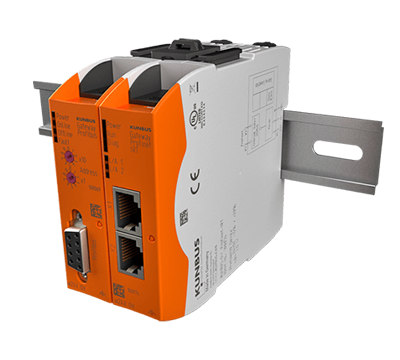 PROFINET IO is thus a real-time-enabled data transfer and thus can also be used in high-performance drives. The designations RT and IRT describe different real-time characteristics of the communication within PROFINET IO. The PROFINET technology (PROFINET = Process Field Network) was developed based on the Ethernet-TCP/IP by PROFIBUS & PROFINET International and offers fast real-time data communication via existing Ethernet networks in the field of industrial communication. It does not matter whether it is clock-synchronized motion control applications, drive technology, building automation, process automation, or manufacturing technology, as PROFINET permits fast data exchange via Ethernet networks in connection with industrial IT tasks. To meet the most demanding requirements for the speed of data transfer (in real-time) - the PROFINET technology has a modular base and is thus composed of two variants, with the main difference in the type of data exchange. The variants are called CBA (Component-Based Automation) and IO (decentralized periphery). PROFINET was further divided into the performance classes of TCP/IP, RT, and IRT. Profinet CBA is generally known as the “source variant” of the technology. This component model permits data exchange/communication between intelligent automation devices. As it pursues setting up of distributed automation on the basis of Ethernet-TCP-IP and thus distributes a task to different devices, Profinet CBA is not suited for real-time applications. What is PROFINET CBA suitable for? PROFINET CBA is used in the field of autonomously functioning plant units where the design is identical or can be changed easily. Differing from CBA technology, PROFINET IO is modern, suitable for the market, and thus could establish itself as one of the most-used Industrial Ethernet networks. It is based on the model of PROFIBUS-DP that has proven itself in the past. The Fast Ethernet technology is used for transfer in real-time (RT), which enables the transfer of IT functions, parameters, and demand data. For experienced users, PROFINET IO offers the ability to use know-how of PROFIBUS-DP (for example RD485 PRORFIBUS, RS232, PROFIBUS slave, master slave, SPS). A device description serves to connect the decentralized field devices. (The manufacturer describes the properties of the field device in advance in a GSD file.) Afterwards, the signals are fed cyclically into the SPS. After processing in the SPS, output is sent to the field devices. However, the master-slave process is not being used here. The provider-consumer model is used to support the data exchange between the individual devices. In contrast, the provider does not require a request to send data. Parameterizations, diagnoses, and alarms are other functions enabled by Profinet IO - in addition to cyclic payload exchange. The PROFINET IO technology thus offers, above all, the advantage of real-time transfer (RT = Real-Time) of data. This is made possible by handling the real-time data of PROFINET IO with a higher priority than TCP/IP data. This priority guarantees the data exchange and thus bus cycle times in the low millisecond range. In addition to real-time transfer, PROFINET IO also permits clock-synchronous data exchange (IRT = Isochronous Real-Time). The determinism in the IRT data exchange requires maintaining the highest precision at the start of a bus cycle. This is the main difference from RT communication. Furthermore, the data exchange cycles in case of IRT communication of PROFINET are between several hundred microseconds and one millisecond. Accordingly, the start of a bus cycle deviates by max. 1 µs in the case of IRT communication. For this reason, IRT communication is ideally suited for motion control applications, as positioning processes require a very precise bus cycle start. PROFINET is considered to be one of the most-used Ethernet-based solutions in automation technology, and it connects the periphery to the control technology. With the start of mass production industry PCs, fieldbus and Ethernet networks were used more and more. With PROFINET, a universal standard was created for data exchange in automation technology. Even at the start of this development, there were too many incompatible Ethernet solutions available on the market, so that a standard was required. This was created with PROFINET. Today’s communication with PROFINET is possible via copper and light waves, as well as with the aid of modern wireless connections (Bluetooth, W-LAN). This covers all requirements in the sector of control and safety solutions. Based on the fact that the PROFINET network redundancy is based not on a manufacturer-dependent or proprietary basis, but on standardized processes, more and more nodes will also be installed in the future, with a predicted yearly growth rate of 30 %.